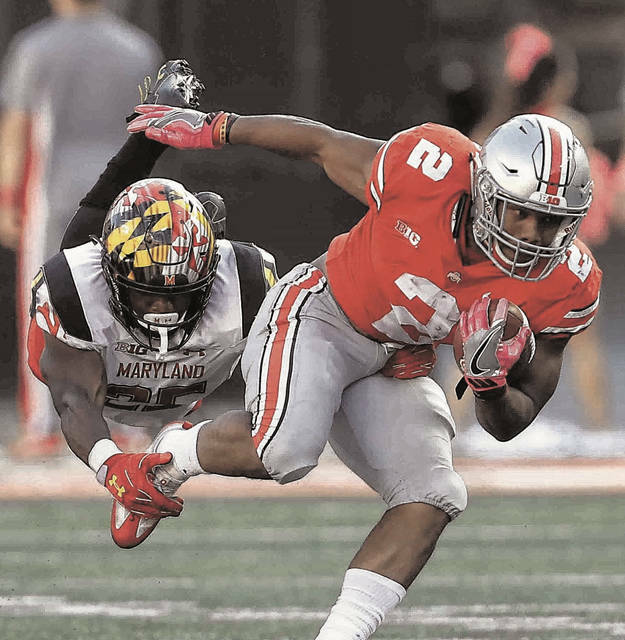 Ohio State freshman running back J.K. Dobbins tries to break away from Maryland’s Antoine Brooks earlier this season at Ohio Stadium. COLUMBUS – When Ezekiel Elliott finished his Ohio State career with 16 games in which he carried the football 20 times or more the idea that just two years later OSU’s No. 1 running back needing to get more carries would be a hot topic of conversation would have seemed impossible. Freshman running back J.K. Dobbins, the most dynamic runner Ohio State has had since Elliott, had only six carries in the Buckeyes’ 55-24 loss to Iowa last Saturday and four of those were in the first quarter. That number was magnified by the unexpected nature of the loss and the futility of the Buckeyes’ offense, which started fast but scored only seven points in the game’s final 40 minutes. Dobbins, who has rushed for 914 yards, has another game of only six carries this season and has not gotten more than 14 carries since the opener at Indiana. Another signal that Dobbins could have a heavier workload on Saturday when Ohio State plays Michigan State at Ohio Stadium is that he was listed as the No. 1 running back on OSU’s depth chart for the first time this week. Until now he and Mike Weber were listed as co-starters. However, it might be wishful thinking to believe Dobbins will have a huge day against Michigan State’s run defense, which leads the Big Ten and is third nationally. The Spartans have allowed only 87 yards a game on the ground and no running back has gained more than 67 yards against them this season. They held Saquon Barkley to 63 yards in a 27-24 win over Penn State last Saturday. Iowa’s Akrum Wadley gained 30 yards on 17 carries against MSU, which held Notre Dame’s Josh Adams to 56 yards on nine carries and Northwestern’s Justin Jackson to 41 yards on 17 carries. Twelve of the 20 running plays of 20 yards or more that Ohio State has this season belong to Dobbins. Ohio State offensive coordinator Kevin Wilson says the Buckeyes’ coaches recognize what they have in Dobbins. “He’s been great. And going forward, yeah, we’ve got to get him carries. We’ve got to. But I don’t think we can force it, either,” Wilson said. “We can’t be stubborn about it. But he’s a special player, he’s a special kid. We’re not trying to take the air out of his ball. Quarterback J.T. Barrett carried the ball more than any other Buckeye against Iowa, 14 times. Ohio State called 30 running plays in the game but only four were designed quarterback runs, Wilson said. CAMPBELL WILL RETURN: Wide receiver Parris Campbell says he feels 100 percent and will play against Michigan State after missing last week’s game because of a head injury. “It was a really helpless feeling because I was forced to be here in Ohio,” Campbell said about watching the Iowa game on television. “I was in my apartment. It was just a helpless feeling knowing my guys were going through that and I was sitting at home not being able to participate,” he said. WHITE BACK ON DEFENSE: Freshman Brendon White, who dressed as a wide receiver at Iowa because of Campbell’s injury, has returned to defense, where he plays safety, Meyer said on his weekly radio show on Thursday. FRESHMAN GRIMES STILL IN FLORIDA: Freshman wide receiver Trevon Grimes remains in Florida where he has been since early October, reportedly because a family member is dealing with a health issue. “He’s still there. He’s finishing his classes online. It’s a personal situation,” Meyer said. HOME NOT SO SWEET HOME: The last time the home team won in an Ohio State-Michigan State game was in 2007.